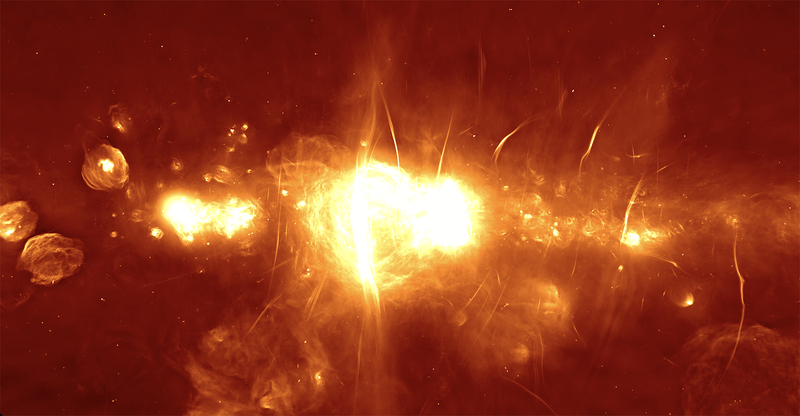 This image, based on observations made with South Africa’s MeerKAT radio telescope, shows the clearest view yet of the central regions of our galaxy. At the distance of the galactic centre (located within the white area near image centre), this 2 degree by 1 degree panorama corresponds to an area of approximately 1,000 light-years by 500 light-years. The colour scheme chosen here to display the signals represents the brightness of the radio waves recorded by the telescope (ranging from red for faint emission to orange to yellow to white for the brightest areas). This image shows a wealth of never before seen features, as well as a clearer view of previously known supernova remnants, star-forming regions, and radio filaments. MeerKAT’s 64 dishes or antennas provide 2,000 unique antenna pairs, far more than any comparable telescope. This design feature contributes critically to making high-fidelity images of the radio sky, including this best view in existence of the centre of the Milky Way. It is also advantageous to observe the centre of the galaxy from South Africa, where it passes overhead and is visible for almost 12 hours each day, unlike from northern hemisphere locations. Radio array telescopes do not measure the very largest, smooth structures in a given region of the sky. That additional information can be obtained using single dish radio telescopes; for the MeerKAT image shown here, that information is from the Green Bank Telescope (courtesy of Bill Cotton, NRAO).